The Christmas season is a blessed reminder that we all have a reason to sing! Won’t you join me in recapturing the wonder of Christmas with the 31-day Advent devotional, The First Songs of Christmas, by Nancy DeMoss Wolgemuth. This beautifully written and designed book celebrates the original carols recorded in Luke 1–2, which announce the arrival of Christ. Grab your copy today! Then tune your heart to join the chorus through the Advent blog and Advent Experience Guide. Together, let’s unwrap a daily dose of joy and awe for the Savior’s birth (add a mug of steaming hot peppermint cocoa if you like!). PS: For your Christmas gift-giving list, there are discounts for bundle orders! It was a bold, and some would say, presumptuous prayer. But thankfully, God had already started to answer my prayer before I prayed it. And He was about to surprise me with the wonder of His loving-kindness and the truth that He hems us in, behind and before (Ps. 139:5). 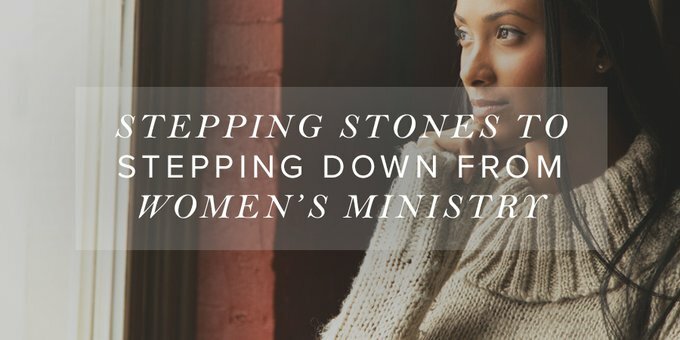 For several months I sensed I was getting weary in my church role as a Women’s Ministry Director and God might be stirring something new in me. I loved my calling at the church and had served there faithfully for ten years. But I was grappling with my purpose and wondered if it might be time to pass the baton of leadership to another woman. The day after asking God to reconfirm my calling or open another door, I had lunch with a close friend and author. Seemingly out of the blue, she told me her publisher had called to let her know he was considering me for a position as an acquisitions editor for the women’s line of discipleship resources. It was the kind of job I’d dreamed about decades before when fresh out of college. I knew God was up to something. It’s now been just over four years ago that I joined Chicago-based Moody Publishers working remotely from Colorado. And I love this new ministry calling in my life. But I also know that if this change had not been God’s best plan for me in this season of life, I could be miserable, even if the door opened wide. That’s why it’s so important to be discerning. If you find yourself in a season of burnout or wrestling about staying in your current ministry leadership role, I encourage you to seek His heart and voice above all others. Here are some practical ways to discern your next steps. 1. Seek God’s heart through prayer and His Word. God doesn’t always answer our prayers so quickly and boldly as in my situation, but if a persistent restlessness lingers in your leadership role, engage your heart with Him in a season of prayer—perhaps even fasting—and ask our faithful God to make His plans known to you. I remember another season while leading a ministry years ago when I wondered if I should stay in that role. I assumed my restlessness and discontentment meant God was going to lead me elsewhere. But after seeking Him through prayer and His Word, He confirmed I wasn’t supposed to go anywhere. Instead, He showed me that I’d been trying to lead in my own flesh and strength and that I was dealing with burnout. I realized I needed to recalibrate and lean into God more for His guidance and strength. As I sought God’s leading, I also asked my husband and a few trusted leaders to pray for me. I was honest that I was facing burnout and seeking God’s guidance. Their faithfulness to pray helped me to know I wasn’t alone, and soon I sensed a fresh calling on my life to remain in that leadership role until our family moved away a few years later. I did the same with my most recent season of transition, and my family and friends celebrated with me when God opened a new door into Christian publishing. 3. Make family your first priority. Being called to ministry leadership can be so exciting and life-giving that it’s easy to let that calling take precedence over other roles in our lives. Anyone who has served on a church or other ministry staff knows that even if you say you’re only working part-time, it can quickly turn into a forty- to fifty-hour work week. I fell into that cycle while on staff part-time at my church in Michigan where I became a very distracted mom to my girls, who were in elementary school at the time. I remember once trying to help my eight-year-old daughter with her AWANA verses at the last minute before we had to rush back to the church—yet again—for AWANA and for me to teach a women’s Bible study. I pleaded with Kelly to learn her verse quickly. Impatient and testy, I raised my voice, “Kelly, repeat after me: Be ye kind to one another, tenderhearted . . .” And yes, the irony of raising my voice at my daughter while teaching her a verse about being kind didn’t escape my notice. Ask most adults who grew up as PKs (pastor’s kids), MKs (missionary kids) or WMDKs (women’s ministry director’s kids) and most will tell you that they often felt like the people in their parents’ ministries were more important than they were. Now, I don’t want to heap guilt on anyone, but I do wish to share a cautionary note that if your ministry leading distracts you from leading your children, then it’s time to consider stepping down for a season. Okay, I know that’s not a real word, but it has a ring to it, doesn’t it? Taking a sabbatical from your busy ministry callings can be a life, and ministry, saver. Even just a one-day “sabbatical” can make all of the difference. I wrote another article about scheduling CARA, “Come Away and Rest Awhile” days with the Lord based on His invitation to His disciples in Mark 6:31 (NASB), “Come away by yourselves to a secluded place and rest a while.” It was during my CARA day a few years back when God made it very clear that He was bringing something new in my life. So when the door opened wide to join Moody Publishers, I walked through it with confidence. Dear leader, if you’re in a season of restlessness or even confusion about your calling, please remember that our God is not a God of confusion. May His voice be the loudest over you. He may show you His best plan through His Word, prayer, fasting, the counsel of wise friends or family, or even through the lyrics of worship songs. He’s done that for me through my own ministry leadership journey for decades, and He will be faithful to lead you as well. I’d love to hear from you! Let me know how I can be praying for you as you seek His voice and leading for your next steps in your ministry calling.